A fantastic opportunity to purchase a classic piece of English furniture. 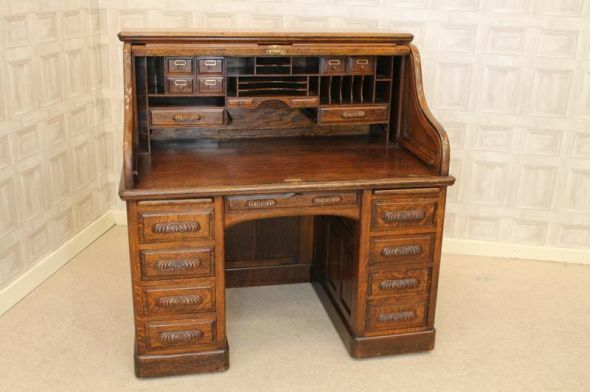 This beautiful and impressive solid oak roll top office desk features a traditional tambour front which opens up to reveal numerous drawers and slides. An ideal item for storing all letters, stationary etc. This sits upon a pair of pedestal bases with numerous drawers; one of which is a filing drawer. These drawers are completed with carved handles which makes this a desirable piece of period office furniture. The desk is in lovely condition for its age, but sadly, we do not possess the key. All drawers and the tambour front run smoothly. It breaks down into four pieces for ease of transportation and reassembly.